Police Sr. Sgt. 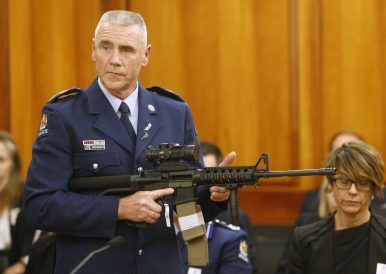 Paddy Hannan shows New Zealand lawmakers in Wellington on April 2, 2019, an AR-15 style rifle similar to one of the weapons a gunman used to slaughter 50 people at two mosques. New gun controls are expected to become law by mid-April, within a month after the Christchurch mosque attacks. The bill would ban the types of weapons a gunman used to kill 50 people at two mosques in Christchurch last month. Seemingly drawing a distinction with the United States, where gun possession is constitutionally protected, Nash said that in New Zealand, gun ownership remains a privilege and not a right. Conservative lawmaker David Seymour was the only one to vote against the bill, saying it was too rushed. “Doing it in nine days before politicians go on their Easter break is starting to look more like political theater than public safety,” he said. Some are opposed. More than 14,000 have signed a petition filed in Parliament that says the law changes are “unjust” for law-abiding citizens and are being driven by emotions. By Nick Perry for The Associated Press. Less than a week after the deadly shooting at two mosques, New Zealand’s government is moving forward with gun control. The Islamophobia Epidemic in AustraliaMass Shootings at New Zealand Mosques Kill 49; 1 Man ChargedNew Zealand’s Ardern Tours Polynesia, What About the Politics?Kiwi Surprise: New Zealand Tilts LeftNew Zealand's Next Government: What's at Stake?